Home › Learning Design › Tech for active learning in large groups. Tech for active learning in large groups. 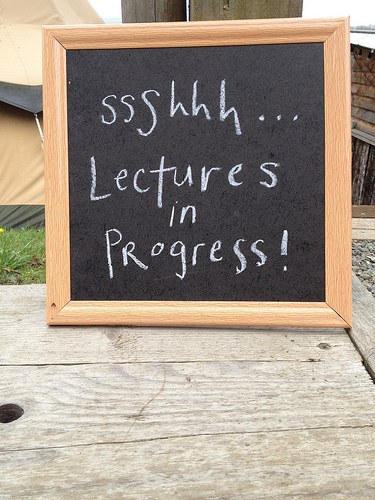 How can we promote and manage active learning during lectures? How can we measure student understanding and make sure that students are engaging with material? In 1972, Donald Bligh (1) undertook an extensive study on the use of the lecture as an educational format. He found that it was effective but not more effective than other methods used for transmitting information and that it is relatively ineffective for many other aspects of education including the promotion of higher order thinking. Bligh also observed that concentration levels of students typically drop after 10 – 15 minutes of passively listening to a lecture. Since these studies took place, technology has provided us with an increasingly sophisticated, interactive and accessible range of formats for transmitting information and facilitating active learning. This article looks at a few tried and tested strategies for using technology to enhance learning for teaching large groups of students. This model changes the dynamic of learning and teaching to enable more active learning and can be applied to both small and large group teaching across a range of disciplines. The basic premise of this model is that pre-class independent study is typically focussed on transmission of knowledge, whilst time in class is spent on active learning to provide opportunities to apply concepts and reinforce understanding. This approach is commonly used in conjunction with the peer-instruction and team-based learning methods mentioned in this article. 7 things you should know about flipped classroom provides a useful introductory guide. We have recently set-up a flipped learning group for staff at University of Sussex, please see our webpages for details if you would like to be involved. Eric Mazur, physics professor at Harvard University developed the peer instruction method during the early 90’s as an alternative to the traditional lecture. Due to the realisation that whilst his students had developed surface knowledge required to pass an exam, they lacked a genuine understanding of the basic concepts of the subject. During the peer instruction process, the tutor poses a question and then facilitates a round of discussions, questions and answers between pairs and the class. Responses are communicated using a student response system. This method provides each student the opportunity to contribute, receive feedback, develop their own understanding and consolidate learning. You can see an example of this in action in the following video clip. Larry Michaelsen (2) developed the team-based learning method as a scalable solution for making deep discussion, peer evaluation and problem solving activities manageable for large classes. In this approach, students study preparation material individually before class; during the class, they participate in a multiple choice test, individually and then as a team. This is then followed by a mini lecture to clarify responses and a series of concept application exercises. Technology can be used in a number of ways to support this approach, from using online quizzes, student response systems and online collaboration tools to facilitate in-class activities to using virtual learning environments and multimedia to provide preparation material. See case-studies from the University of Texas and University of Bradford for more information on this approach. A backchannel is an online space for communication which complements (and potentially continues before and after) a lecture, presentation or teaching session. Increasingly, students are taking it upon themselves to bring laptops and mobile devices into the classroom to look up information, take notes and chat with peers – often in isolation from the rest of the class. Setting up a dedicated backchannel for a class to share notes and ask questions can be a powerful way to enable interaction, collaboration and develop a sense of community. Technologies for facilitating this might include the use of social media platforms, creating a class twitter hashtag for students to contribute to or using websites such as TodaysMeet, Moodle (Study Direct) chat to create a safe and private channel space for real-time discussion. 7 things you should know about backchannel communication and Nik Peachey’s Managing the digital classroom – Using a backchannel provides useful introductory information on this topic. It can be a challenge to effectively organise and manage large groups of students participating in learning activities. Here are a few tools which can help to ease classroom management. Instant classroom – provides a range of tools for organising classrooms, including seating chart makers, name generators and group making facilities. Team+ – a free educational tool for creating team profiles, roles and tracking progress. Free countdown timer – a simple but effective countdown timer which can be projected from your computer screen to time activities during class. Availability and access to technology can often be seen as a barrier to adopting approaches which require students to bring their own devices to class. It is important to give students advance notice of what’s required so that they know what to bring or can make arrangements to borrow equipment from the university. The library and IT Services have set up a Chromebook loan scheme which allows students to borrow laptops for up to six hours for use anywhere on campus. Alternatively, planning pair or group activities is a great way to encourage collaborative learning and to share resources to ensure that all students can participate. If you would like to find out more about how technology can be used to facilitate large group teaching, please contact your School Learning Technologist. We run a rich programme of TEL workshops that you might find helpful. Please see our latest workshop programme which includes ‘Flipped learning: from transmission to active engagement’ and ‘Teaching to large groups with technology’. ‹ What’s new in the A-Z of apps? 2 Pings/Trackbacks for "Tech for active learning in large groups."